This article first appeared in The Edge Malaysia Weekly, on October 16, 2017 - October 22, 2017. IT is perhaps no surprise that Malaysia’s median monthly income continued to grow, but at a slower pace, in 2016 compared with 2014, as shown by the newly released Household Income and Basic Amenities Survey 2016. The survey was the first done since the implementation of the Goods and Services Tax (GST) in April 2015. Meanwhile, the country’s economic growth has slowed from 6% in 2014 to 5% in 2015 and 4.2% in 2016, but looks set to expand to at least 5% this year, ahead of a general election expected early next year and which has to happen by August. Apart from the rise in the cost of living, especially in key cities, politicians know all too well that the lack of really affordable houses is one major grouse of the electorate. Anyone who’s been paying attention to Bank Negara Malaysia would know that access to financing is not the problem with people not being able to buy a house. The real problem is that a median household simply does not have enough income to comfortably buy a house, especially when one considers the need to save for one’s old age. 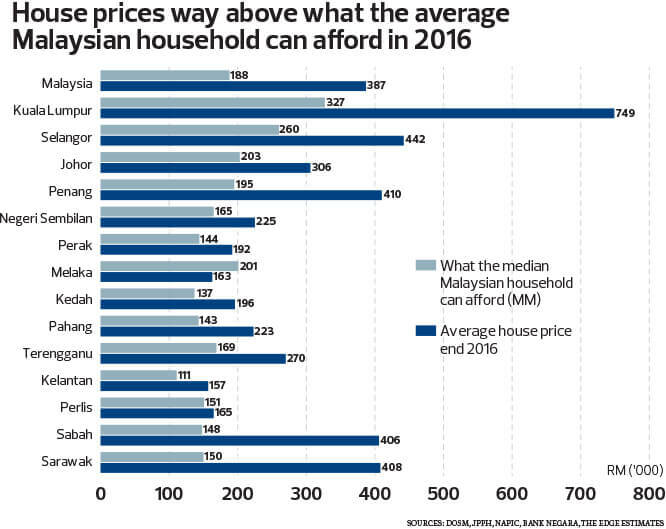 The latest data indicates that average house prices in Malaysia have worsened from “seriously unaffordable” levels in 2014 to “severely unaffordable” in 2016. The latter is defined as above 5.1 times house price-to-income ratio. Here’s why. Malaysia’s median monthly household income grew from RM4,585 in 2014 to RM5,228 in 2016, up 6.6% per year at nominal value and 4.4% in real terms, according to the Department of Statistics Malaysia’s (DoSM) report on the 2016 Household Income and Basic Amenities Survey. That means RM188,208 should be the maximum affordable house price, using Demographia International’s Median Multiple (MM) method, where a house is considered affordable if it is less than three times the household median annual income. 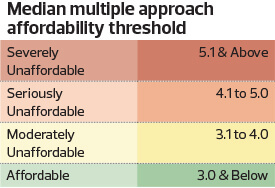 The bottom 40% (B40) households can only afford homes priced up to RM108,000 each while the middle 40% (M40) households can afford up to RM225,900, based on the B40 and M40’s median monthly household income of RM3,000 and RM6,275 respectively. That’s some way below Malaysia’s average all-house price of RM387,258 as at end-2016, according to data from the Valuation and Property Services Department (JPPH). Using the MM method, a household would have to be earning RM10,757 a month for the average house price to be affordable. But the latest DoSM survey data show 78% of Malaysia’s 6.95 million households live in urban areas and earn below RM10,000 a month. Some 41% or 2.23 million urban households earn less than RM5,000 a month. The RM387,258 end-2016 average house price is also six times the 2016 median annual household income, translating into a “severely unaffordable” house price-to-income ratio of 6.17 times. The median house price to median household income ratio has consistently exceeded the “affordable” level of three times since 2004, Bank Negara said in its 2016 annual report. Houses in Malaysia reached levels considered “seriously unaffordable” in 2014 (house price-to-income ratio of 4.4) compared with “moderately unaffordable” levels (four times house price-to-income ratio) in 2012, the central bank said in its 2015 annual report. In the same report, Bank Negara pointed out that the house price-to-income ratio had reached “severely unaffordable” levels of 5.4 times in Kuala Lumpur and 5.2 times in Penang in 2014. Based on the latest DoSM and JPPH 2016 figures, the situation has escalated further, back-of-the-envelope calculations show. While median household income in Kuala Lumpur is higher at RM9,073 — pushing house affordability levels to RM326,628 — the actual average house prices in Kuala Lumpur was RM749,305 as at end-2016, translating into a 6.76 times house price-to-income ratio. For that RM749,305 average to be affordable, a household’s monthly income needs to be RM20,814 — which is just above the average income of RM20,201 for the top 20% of Kuala Lumpur households in 2016. In central Kuala Lumpur (KL and Ampang), the average terraced house price has reached RM976,019 while terraced house prices in South Kuala Lumpur (Petaling, Cheras) averaged RM651,221 — a tad below RM684,546 in North Kuala Lumpur (Batu, Setapak, Ulu Klang). There are cheaper alternatives: the average high-rise in South KL was RM299,688 at end-2016, below the average high-rise price of RM518,145 and RM484,218 in Central and North KL in 2016, JPPH data show. The high prices may be one reason homeownership in Kuala Lumpur is 62.2%, below the national level of 76.3% and 73.7% in urban areas. In Selangor, where homeownership is 70.2% (69.6% urban and 80.1% rural), the average house price was RM442,007 as at end-2016, translating into a “severely unaffordable” house price-to-income ratio of 5.1 times, based on the median household income of RM7,225 per month. In Penang, homeownership is slightly higher at 79%, likely helped by rural homeownership of 85.9% that includes mainland residents in Seberang Prai. A median income of RM5,409 in 2016 for Penangites means at least half of them can only afford houses priced up to RM194,724. Average house prices were RM410,058 at end-2016, aided by lower prices in Seberang Prai where an average terraced house only costs RM281,532, and a high-rise, RM121,370 at end-2016. 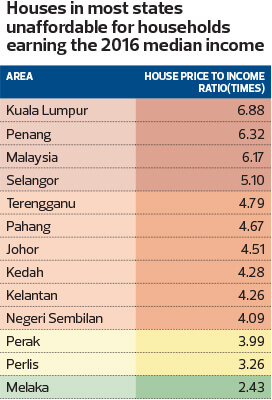 In Penang Island, however, an average terraced house costs RM896,603 and a high-rise costs RM359,492, JPPH data show. Even using 2014 data, the central bank had noted that house prices were most unaffordable in George Town at RM600,000 more than two years ago when the affordable ceiling was deemed RM256,000, according to its www.housingwatch.my website. The central bank has, at least in the past two years, cautioned on the need to have carefully-designed policy interventions to ensure the housing market can accommodate housing needs for all income groups. It had called for the setting up of a central authority to lead, oversee and coordinate affordable housing initiatives for the country. The single body would also monitor and ensure a good balance of the overall property supply and demand situation nationwide with the aid of a comprehensive, integrated and transparent nationwide database or repository. Second Finance Minister Datuk Seri Johari Abdul Ghani too has, on more than one occasion, suggested the setting up of a single entity to solve the affordable housing challenge. There is no time for delay if the 2016 data truly reflects the situation on the ground.